Contrary to popular belief – YES, it does get cold here in sunny Spain in winter! Don’t get me wrong – even in the depths of February we usually have sunny days with blue skies, but as soon as the sun begins to drop behind the nearest hillside, it’s time to change into jeans and thick socks ready for the cold evenings and nights. By European standards, the temperature doesn’t drop very low (around 6 Celsius) – after all, that’s one of the main reasons we moved here from England’s perishing winters, but it surely feels cold. Houses around here are built to keep out the warmth of the sun during the long, hot summer months rather than for keeping warm in winter. Village houses are built close together (causing shade), and with small windows. More modern houses, like ours. might have patio doors and larger windows, with insulation in the walls – but we still have tiled floors rather than carpeted ones and inadequate heating (by UK standards). Fortunately, on our land we have 47 almond trees, which come in handy when pruning time comes around during the autumn months. Branches here and there are selected for firewood – after which I send my hubby out with the saw. Here cometh the first benefit! On another day, the branches need chopping into smaller logs to fit in the fireplace, before being stacked in a dry place. 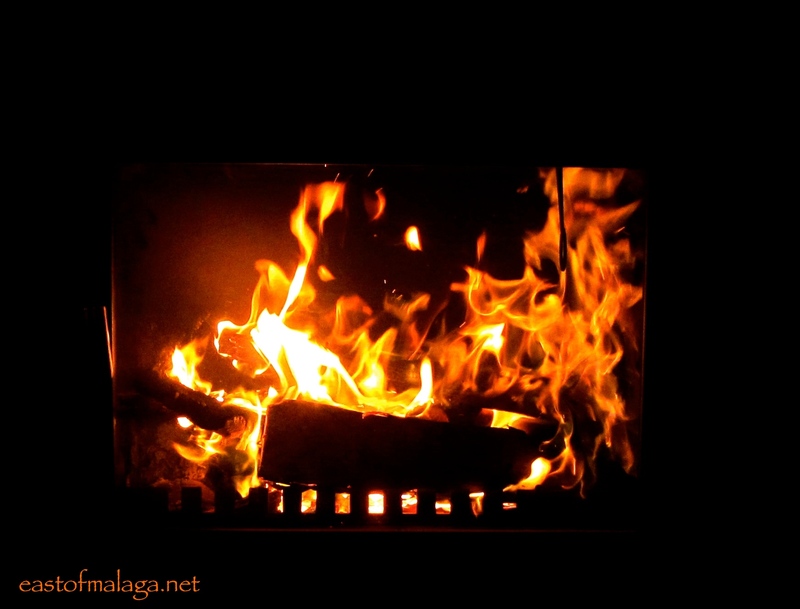 Later follows the third, warming benefit ….. and the bit I like best – the log fire! See how much better warming value we get, rather than telephoning a local supplier for yet another load of logs to be delivered. Do you have a log fire and do you get such good value from yours? This entry was tagged Andalucía, Cómpeta, East of Malaga, Europe, gardening, gardens, life, lifestyle, Malaga, photography, Spain, weather, winter. Bookmark the permalink. To heat our house we need to light a fire pretty much after lunch and we get through so much wood. Looking at the wheelbarrow, roughly how many of those logs would you get through if you lit a fire at, say, 5pm and kept it going until 9pm? Here in La Alpujarra (450m above sea level, so relatively ‘low’) the temp has recently been dropping to 1 or 2 degrees each night. Hmmmm it does use quite a lot of wood. 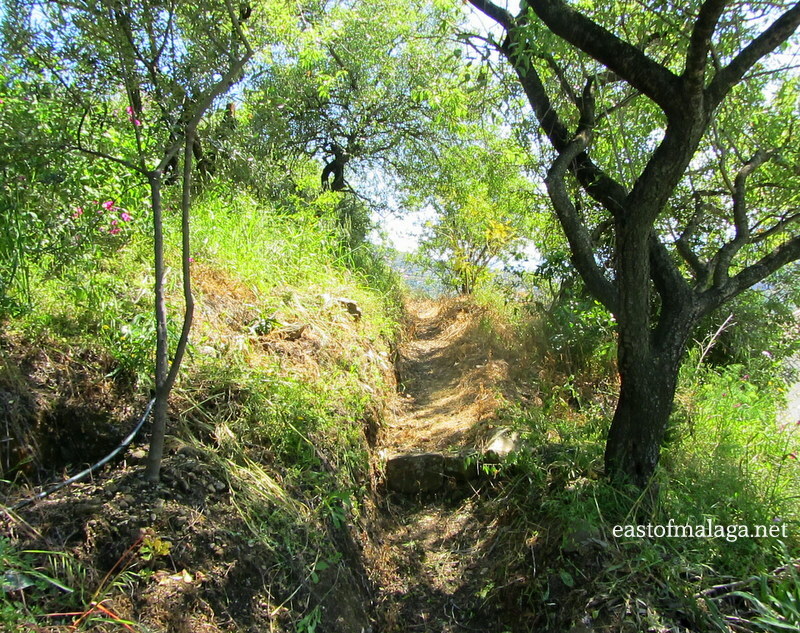 Maybe half a barrow through til bedtime (we are at 425m). Hey – wanna come and chop some logs for me???!! That’ll keep you warm. We always say that we see more snow here in southern Spain (albeit from a distance on the mountain tops) than we ever did in north-west England. I can agree with you the log fire is a godsend. And as for phoning a wood supplier I have never had to and hopefully never will. There’s always old pallets about and stuff and don’t forget the drift wood. Even collecting acorns will do and your getting a bit of exercise as well. So pretty!I love fires and that is cool you can use your own logs. I wish we used our fire place more. Lovely! We only tend to light the log fire a couple of times a week, Angelia – in truth, it uses a LOT of wood! Sadly we dont get such good value as you from the wood for our fire – it would be lovely to have almond trees and prunings, and enough to use for fuel. Of course, we are fortunate because of the number of trees we have – otherwise we would have to buy locally, too. We sadly lost two lemon trees and a plum this summer, all mature, but at least we now have plenty of free firewood for our new chimenea! Love the heat, light, smell, movement of flames. Nearest you get to cosy here! OOHHHHH what made your trees die, Fiona? 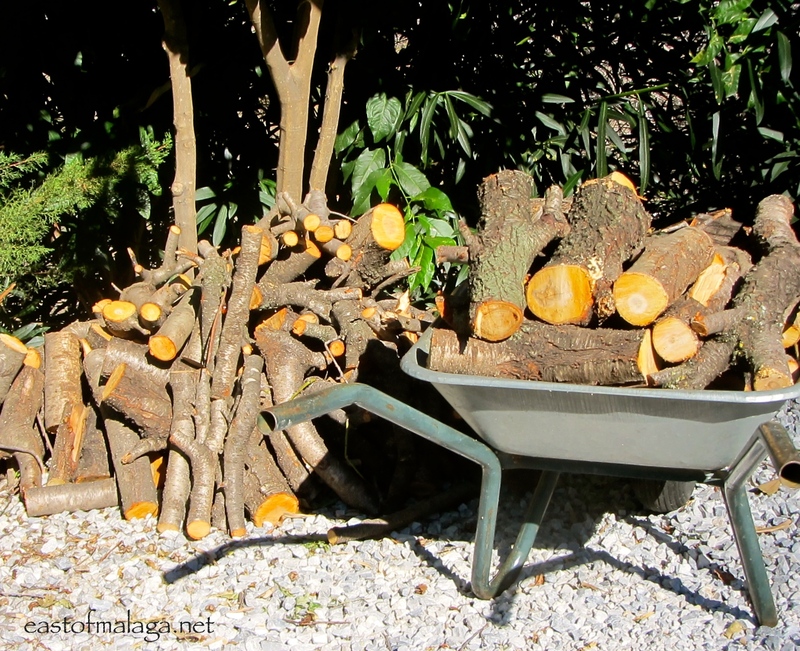 I love free firewood – but thankful that I don’t have to chop it! 47 trees, that’s a lot bakewell tarts! It’s freezing in Italy too. We have a log fire but it is not as pretty as yours. I think many people think it’s hot all year round, here. Just trying to dispel the myth! The houses here really aren’t designed to stay warm. I’m freezing! I don’t kind of heating so I had to run out and buy a radiator this week. I wish it only got to 6º here! OOHHH do those radiators warm the room, Jess? It is a pain to keep them clean (particularly the glass fronted cassettes – best to use a bit of oven cleaner) but I do feel sad when winter is coming to an end and I cant justify using the fire anymore…. the heat is much more intense than central heating, it has a distinctive smell and is also romantic. I heard that you use a damp cloth, dipped in the ash to keep the glass clean, Antonio. 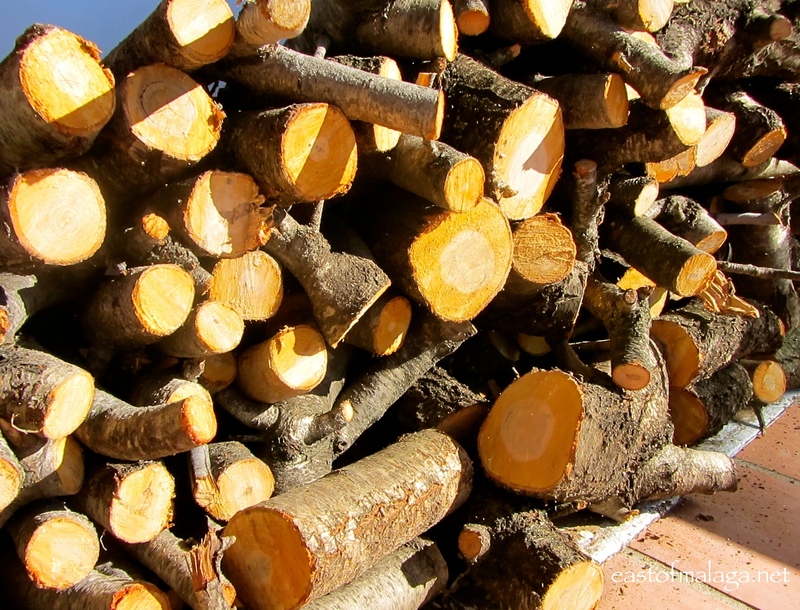 yes and yes – just had the logs chopped and I too keep taking pics of it and post them on Twitter. Blue sky here now but not like yours. Today it’s BRRRRRRRRRrrrrr in Toledo. Temps do go down to below zero. But at least the sun is out. And, when the sun’s out – I can get my washing dry, too! I’ve just put mine out! Oh it’s the same for us! Chopping, stacking and burning – that wood really keeps us warm doesn’t it 🙂 Took me a while to get used to just heating the area you’re in rather than having a completely centrally heated house – but now we just put on a few layers and later in the evening enjoy the fire. Lovely shots! Yes, Tanya – very different from the UK where all the house is centrally heated. We don’t have enough wood for log fires all the time, so in between we use the air-con switched to hot! Haha, yes, we leave all the more physical jobs to the colder weather too. Unfortunately we don’t have enough trees to heat us through the winter though, so we still rely on Andrés and his trailers of encina. We usually fill the leñera in spring, just as we stop using the wood stove – then it’s all dried out, and gives better heat and less smoke, when we need it in November. …AH, we do ours as we go along!